Born in Dortmund in industrial western Germany, Gerta Overbeck-Schenk was supported in her artistic aspirations by a merchant father. After qualifying as a drawing teacher in Düsseldorf, she went to Hannover in 1919 to study at the School for Artisans and Crafts. There she met Grethe Jürgens, Erich Wegner, Ernst Thoms and other artists. The bond of friendship that connected this group derived from their left-wing and generally anti-establishment views, as well as a similar outlook on art. In the early 1920s, Overbeck joined the Communist party. 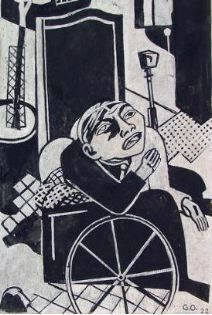 In 1922, increasing financial difficulties forced Overbeck to obtain regular employment as an art teacher in Dortmund, but she was drawn back to Hannover in 1931. She collaborated with her colleagues, as well as, with writers such as Gustav Schenk on the short-lived (1931-32) publication Der Wachsbogen (The Wax Sheet, named for the inexpensive printing process of mimeographing, which was used in its production). Although Overbeck executed a number of portraits of family and friends, only two self-portraits are known; her main focus was on the industrial and work environment of the Ruhr area and Hannover. For her, industrial and building sites had a visual attraction, stimulating broader human emotions. Although she did not paint such subjects to express a proletarian view or to fulfill a social need, art had to "have meaning and purpose in order that it not lose contact with life and remain understandable and accessible even to the simple person." When Overbeck married Jürgens’ longtime companion, Gustav Schenk, and bore his child from 1937-38, the close friendship between the two women was ruptured. However, the marriage was not of long duration. Overbeck moved to the small town of Cappenberg, where she was active as a creative artist for the rest of her life. Her work has been included in most Neue Sachlichkeit shows during the past sixty years.